Director: JON COHRS is a director and visual artist based in Brooklyn, NY. His work often uses public engagement, collaboration and site-specific explorations to address global issues. Recently, he created OMG TV; an analog TV station that went live during the digital transition when television stations turned off analog transmission. OMG TV was used as a reference in a Supreme Court amicus brief on creativity and copyright. 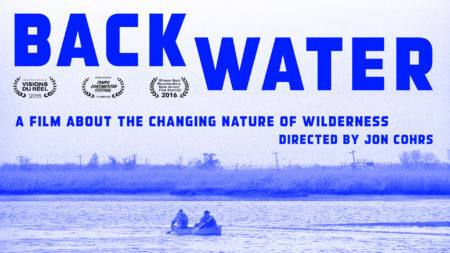 He premiered his feature film ‘Back Water’ about the New Jersey Meadowlands and the anthropocene at the Vision Du Reel Film Festival in Nyon, Switzerland in April 2015. He has been a visual arts professor at Parsons, Pratt Institute, NYU, SUNY Purchase, and Finish Academy of Fine Art. He has also received grants from New York State Council of the Arts Artist Grant, Media Arts Assistance Fund, Mellon Grant, Experimental Televisions Center, FEAST, Future Everything and fellowships from Eyebeam, NYFA, and the Banff Centre for the Arts in addition to numerous residencies throughout the US and Europe. As an audio engineer he recently mastered the soundtrack for the Oscar nominated film, ‘Nebraska’ and ‘My Old Lady’ by the playwright Israel Horovitz. Producer/Editor: ANNE GARRETT is a documentary film editor based in Brooklyn, New York. Her credits include “Welcome to the Machine” (2012), “The Mexican Mormon War” (Vice Media, 2012) and “Female Rebels of Kurdistan” (Vice Media, 2012). Previously, she was a book editor and literary agent, where she oversaw a diverse list, including an annotated collection of prints from the Black Panther Party archive, a book of illustrated lyrics with legendary animator Bill Plympton and rapper Kanye West, and a travelogue on the Lincoln Highway, America’s first paved coast-to-coast road. She started her documentary film career at Gidalya Pictures in New York City, assisting for Penelope Falk, winner of Sundance’s Excellence in Editing award. She is currently producing a documentary on a community of adults with Autism in Columbus, Ohio with director Alexandra Shiva. Co-Writer/Editor: CYNTHIA LOWEN is an award‐winning filmmaker, writer and poet. She is the producer and writer of the feature documentary film ‘Bully’, released by The Weinstein Company. She is also the author of ‘The Cloud That Contained the Lightning’, winner of the National Poetry Series. Cynthia is the recipient of the 2013 Women Authoring Change Fellowship from William Morris Entertainment, the DuPont‐Columbia University Awards for Excellence in Journalism, and the Discovery/Boston Review Poetry Prize. Producer: JENNILYN MERTEN is currently producing a new feature documentary with Academy Award winning producers Todd and Jedd Wider about the role of civil liberty in mental health treatment and working an a second feature doc with crowdsourcing expert and entrepreneur Matt Gardner, about the controversial publication of the DSM‐V called “The Manual”. With her co‐director veteran doc filmmaker Tim Smith and producer Claire Ratinon, she continues to work on “LOVESICK”, a very personal project about Parkinson’s and the unexpected side effects of drugs, love and being sick. Merten is the co- director/co producer of the award winning documentary film, ‘Sons of Perdition’ which premiered at the Tribeca Film Festival 2010 and was selected for the Oprah Documentary Film Club (OWN, BBC, 2010). Director of Photography: DEREK HALLQUIST began his career as a camera operator for numerous television shows on networks such as Discovery, Travel and TLC. In 2009, Eugene Jarecki hired him to work as a Camera Operator and Director of Photography on his films. Derek was involved with Freakonomics, which premiered at Tribeca Film Festival in 2010 and Reagan, which premiered at Sundance Film Festival in 2011. Derek was Director of Photography for The House I Live In, which won the 2012 Grand Jury Prize for US Documentary. In 2011, he premiered his short Documentary The Opiate Effect at the Vermont International Film Festival. It has gone on to air all over Maine on MPBN, shown in over 50 schools on the east coast and used in Rehab Clinics around the United States.